Becoming Texan: Movin' on Michigan. 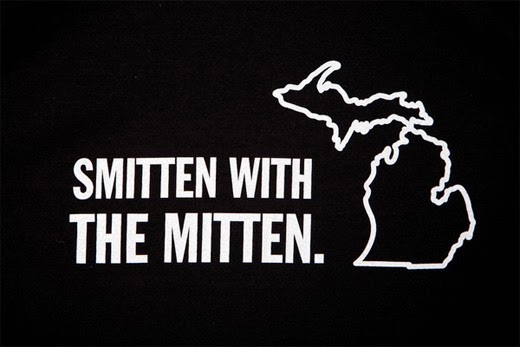 Ten months ago I moved to the Mitten state, officially known as Michigan. Seven months ago I expected to be moving to Texas - before the snow and the cold settled on Michigan, and three months before my apartment lease was up. Four months ago, I accepted the fact I'd need to pack up my apartment for storage. Two months ago I had almost given up hope of being relocated to Texas within my company. One week ago everything changed. In a couple of days, I'll be jumping on an airplane bound for Amarillo, TX and waving goodbye to Michigan. It is the end of an era for me. No longer am I free to pack up and move wherever or whenever I please. No longer will I have to give a paragraph description of where I call "home" because for the first time in eight years, I will finally be home. They say "home is where the heart is," and that's the truth for me. The love of my life is in the Texas Panhandle on a cotton farm and cattle ranch so I'm headed to make a home with him. In August, my last name is changing, moving one step down the alphabetical order - going from an N to an O. Not a native Texan myself, I know I have a few things to learn, like I'd better start brushing up on my Texas history and geography ASAP. I need to ditch the phrase "you guys" from my vocabulary and replace it with "y'all." My spicy food tolerance... well, I'll work on that too. I have to adjust to seeing those silly registration stickers on my windshield. Oh, and my "everything's bigger and better in Texas" attitude will need some development as well. Despite the daunting list of "Texanisms" to learn, I couldn't be more excited to become a Texan! It is going to be a heck of a ride so be prepared for stories of struggles, triumph and Texas. Yeehaw! If you can't be an Okie like your mama, being Texan is the next best thing! Luv ya, honey!